Live webinars for institutional investors. Discussion based webinars hosted by RBC portfolio managers from across the UK based strategies. 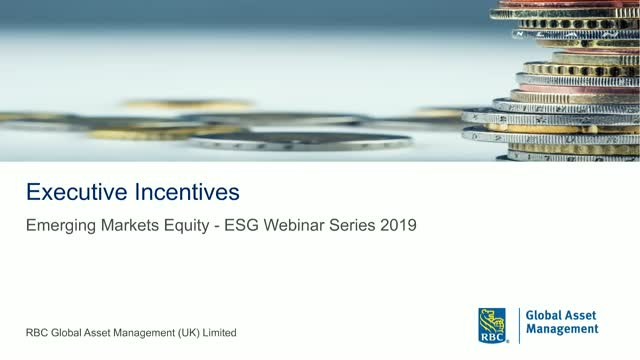 Please join us for a webinar on 4th April where Guido Giammattei, Head of Research, RBC Emerging Markets Equity, and Alex Edmans, Professor of Finance at the London Business School, will discuss executive pay and incentives. Alex will present the findings from his paper The Long-Term Consequences of Short-Term Incentives which provides evidence of the negative impact of short-term CEO incentives on the long-term value of a company. Guido will discuss the chapter on management incentive schemes from the Emerging Market team’s 2018 ESG Report which questions whether or not the increase in incentive pay is correlated to shareholder returns over the longer term. As part of the Emerging Markets ESG Webinar series Phil Langham and Felix Gummer will discuss why plastic has become an issue and increasing awareness and understanding on the topic. Navigating Headwinds. 4th Annual Emerging Market Outlook Webinar. Questions are encouraged before and during the event. We look forward to your participation. Please join Cary Krosinsky and Gabe Rissman co-founders of Real Impact Tracker as they introduce how they rate the social and environmental impact of your investments. Following this Ben Yeoh, Senior Portfolio Manager, RBC Global Equity will outline how his team approach improving the social and environmental impact in their investments. Adoption of responsible investing principles continues to grow at a steady pace. And new data indicates that the majority of institutional investors and consultants have shifted from asking whether to adopt environmental, social and governance (ESG) principles to instead looking at how to implement them. RBC Global Asset Management’s 2018 Responsible Investing Survey reveals the latest views, intentions and actions of institutional investors and consultants related to responsible investing and ESG. The survey reveals that ESG-based investing continued to steadily gain credibility and establish a solid position alongside other fundamental investment approaches. This trend is based on an increased level of acceptance about the merits of responsible investing, and an interest in applying its principles to more diverse asset classes, including fixed income and infrastructure. Please join us to learn results of this year’s survey and discuss the implications and impacts for institutional investors and the marketplace. Please join Marcus Lun, Portfolio Manager, RBC Global Equity, in conversation with Chris Sayner, Vice President, Customer Alliances, Corporate Sustainability at CRODA. Chris is also a member of the RSPO Communication & Claims Standing Committee, board member of the Personal Care Products Council, and writer on Ingredient Integrity™. Together they will discuss sustainability and engagement. RBC Global Equity ESG: Inclusion or exclusion? Please join Ben Yeoh, Portfolio Manager, RBC Global Equity in conversation with Cary Krosinsky, Co-founder and Director of Real Impact Tracker as they discuss sustainability ratings, SDG’s and divestment vs investment. Please join the Head of RBC Global Equity, Habib Subjally, as he introduces his team’s purpose and people with the help of his colleagues Luis Benoliel, and Jeremy Richardson, who will be acting moderator and devil’s advocate! Emerging Markets ESG focus on Modern Slavery and the Issues with Low Cost Sourcing. Please join Zeena Dahdaleh, Portfolio Manager, RBC Emerging Markets Equity as she discusses the prevalence of modern slavery and exploitation and the issues caused by low cost sourcing in emerging markets. Moderated by Isabella Stanbrook, ESG and Sustainability consultant at Sancroft.